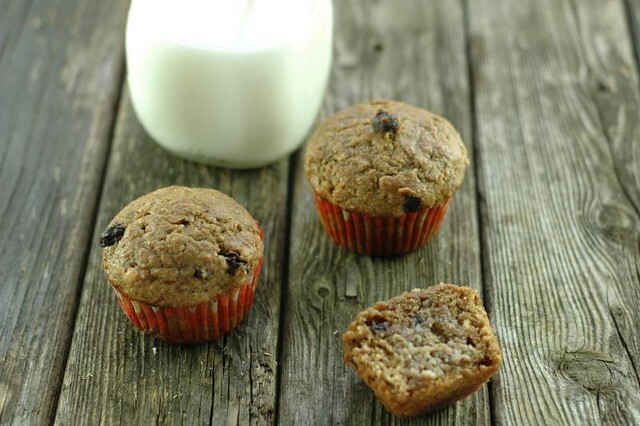 A delicious healthier version of my grandma’s bran muffins. Perfect for breakfast with a cup of hot coffee. Oh good ole bran muffins. Why is it that these supposed healthy bran muffins are so often loaded with shortening, tons of white sugar and flour and little else? 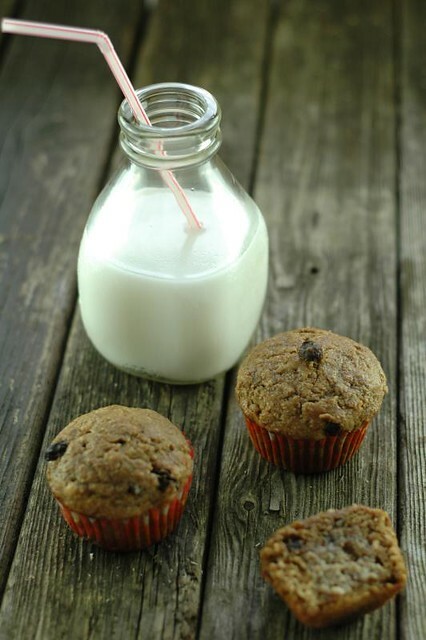 Now don’t get me wrong….I grew up on my grandma’s bran muffins. They were a special treat that we knew would always be waiting for us whether we were at their house or they had traveled up to see us in their motorhome. One would get popped into the oven or microwave and slathered with butter as soon as we arrived to see her, and was always served with a steamy mug of hot chocolate or a big glass of milk. All kids should be so lucky. Of course, I’m sure grandma had ulterior motivates of somehow getting some whole grains and fiber into us without us knowing. So when I got pregnant with Noah and was told to eat lots of fiber for umm….various reasons….I called my grandma up and got her recipe. I recently dug out that recipe and started making these again right before Phin was born, for myself and also in a desperate attempt to find something other than cottage cheese that my son will eat. Turns out that he is a muffin maniac. Moo-ma’s as he likes to call them are his requested meal anytime he thinks they are in the house. So once I got him to eat the full fat/sugar/white flour muffins that grandma’s recipe called for I decided to try and make them a bit healthier so he wasn’t eating a cupcake for breakfast……without him losing interest. I am happy to report that these are still incredibly delicious and yet much healthier for you. Ultimate bonus? This batter is similar to the 6 week bran recipe and we have successfully stored it in the fridge for up to 3 weeks with no adverse effects on the final product! Who doesn’t love a fresh from the oven muffin? Notes: I like the recipe as it stands but in the future in an effort to make an even more nutrient packed a punch I will be trying swapping the white flour to spelt flour and reducing the honey even more. Heck….I will probably be sneaking vegetables into these things soon if this kid will keep eating them! 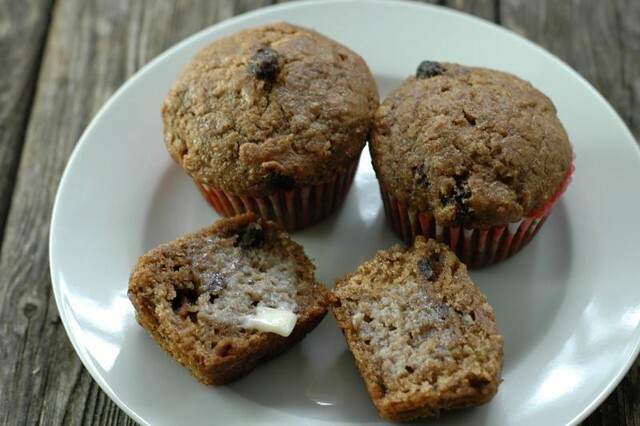 A delicious healthier version of my grandma's bran muffins. Perfect for breakfast with a cup of hot coffee. Combine All Bran, Raisin Bran and Buttermilk and allow to soak. Mix bran mixture and liquid mixture gently. Combine dry ingredients and mix dry into wet ingredients. Do not overstir or you will get tough muffins. Fill muffin tins with liners or spray. Fill 3/4 full and bake 15-20 minutes. These are around 135 calories per muffin and have approx 10.6 grams of sugar. You could reduce the honey even further to lower this or use a lower sugar raisin bran.